That wishes (dreams) are like horses that can carry us forward is something I discovered when I made my first “Wish List” in 1976. I listed things I wanted and noticed that if I put something on the list I ended up with it in my life. Maybe not right away, and maybe not in the form I’d originally asked for, but as long as I continued to wish for it, it came. The wish list helped me focus my attention on what I wanted so I was on the lookout for opportunity in a way I hadn’t been before. Making the wish helped me clarify what I wanted. Wishing helped move me to action. I’ve come to see goals as wishes I’ve clarified and developed through review and assessment, and I recalled the proverb as I worked on my review of last year and began to think about what I wanted this year. I work with Your Best Year Yet by Jinny Ditzler to review my year and set goals for the coming year. Because I’ve used this process for over a decade, I can review past goals to see what’s constant and what arises and flows through. I reread parts of the book each year because it deepens my understanding of the questions and puts the whole review process in a positive framework. How do I limit myself? In what areas am I not achieving what I want? What do I say about myself to explain these failures? What new paradigm statement will support movement toward the life I want? What are 6 to 8 key roles? What role do I choose for my major focus for the coming year? What are my top goals for each role? Choosing from the goals you outlined for roles, what are my top 10 goals for the year? This year I drafted goals for both roles and areas before I began to choose my top goals for this year. For example, even though accomplishments/disappointments and what worked/what didn’t work are similar, I find the answers different so I answered both sets of questions. Since I began doing daily morning pages in 2010, my old journal practice changed and became more sporadic; most of what I was journalling about ended up in Morning Pages. I’d done some journal entries early last year and switched to a weekly format, but stopped in February. When I began to review the year I found I wanted to complete monthly entries for March through December before I did my review of the year and set goals. I used my agenda, referring to Morning Pages where needed, and did a “highlights” of the week entry that included photos, ticket stubs, program notes and books that were influencing me. This took longer than I expected, but was a satisfying exercise. Danielle’s rethink of the whole goal setting process in her new Desire Map program took me in a new direction. I haven’t purchased the program yet, but the information she has shared on her blog and in interviews has been helpful already. Danielle realized that connecting with how she wanted to feel moved her more than goals. She found that her Core Desired Feelings were a truer compass than the goals; that accomplishing the goals were not true endpoints. The Core Desired Feelings (CDFs) were what she truly wanted. I reflected on this as I made my way through my weekly journal summaries and decided I wanted to include Core Desired Feelings as part of my process. This made me ask, what activities and conditions give rise to my core desired feelings? How many goals are workable? When I think about how many goals I can commit to each year I take into account how things went the previous year (what took more time and/or more effort than anticipated), and see if there are there still “live” items from last year. I wasn’t able to complete them in 2012. Two of them I can simply transfer to my 2013 list: complete the first draft of the novel and complete Story is a State of Mind.The other two I will revise: discover how to share my fiction, poetry and essays and maintain my exercise routine. I like Danielle’s five areas because, for me, they are bigger than the role-based approach. Often my role-related goals spring from “should-dos” rather than being more deeply connected to what my soul is calling me to do. It’s also easier for me to keep the list manageable. When I began doing regular yearly goal setting I did a Top Ten list, but now I tend to work with five to eight goals. It’s finding the balance between challenging and overwhelming, between stretch and stasis. Which goals, if accomplished, will make a real difference to you? Try those even if there are only three or four. As I wrote this I realized that this post reflects my creative process. I like lots of things to sort through. I am intrigued by the complex but love essence. I start with more and distill to essence. As I choose what to keep and what to discard I learn more about myself. This messy approach may not work for you;, but in case you love more information, I’ve included links to some of the blogs that I’ve found interesting that discussed this whole end-of-year review and intention setting cycle. Jennifer Loudon Urges us to take all of January to reflect and develop our intentions for the year. 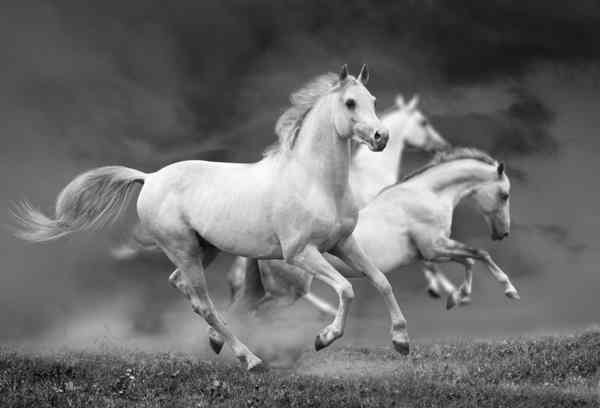 May you be inspired to find the wishes that are horses you can ride to your most successful year. Blessings for the journey. Join the discussion: How do you set goals, if you do? How do you work without goals, if you don’t set them?